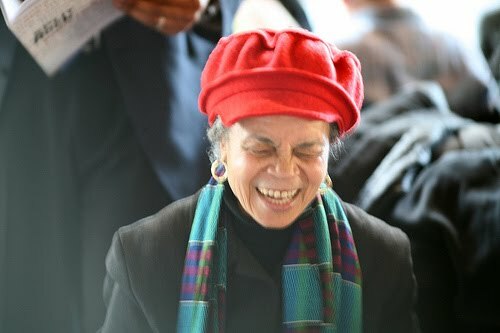 Went to a lovely Sonia Sanchez tribute last night. I decided to post this internet photo of her because it begins to capture the beautiful way she laughs. I appreciate people who balance fierce, unapologetic anger at injustice with full unbridled love and laughter. Actually, they are the same thing right? And, as Sonia reminded the audience, one is likely to be punished for both. The highlight of the evening was, of course, Sonia herself. Her ramble never felt like ramble. So easily she moved from how Philadelphia needs to learn to love itself to telling a story of how she first learned of the atrocity of the MOVE bombing, from how tough it is to walk into a Philadelphia classroom and try and communicate with today's youth, to city officials turning their back on her, at an event they had invited her to, after she was arrested at a peace protest. She powerfully reminded the audience that the true way that we can thank her (or Ruby Dee or Bernice Reagan, or any person who inspires us) is to do the work.